Surely Onyx is not going after the duck. Spent another week over in the Burro Mountains. I was able to hike up to Jacks Peak a few times. 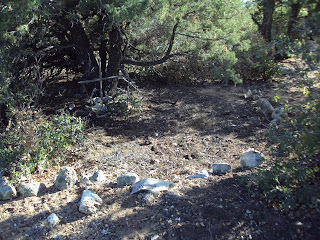 The sand had mostly dissipated at the top so I could see where the trail went. Nice easy hike with only a 1600’ elevation gain in 4 miles. Took me about an hour and a half to hike up. There are radio towers up there and old foundations. Most of our dusk walks are meanders where there are no trails. 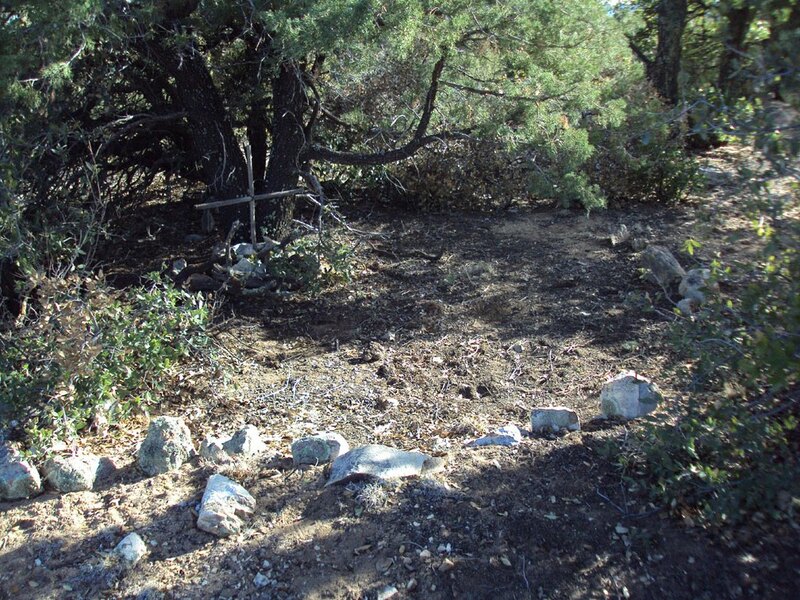 We came across this gravesite off in the brush. 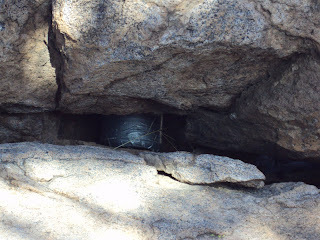 There was a plastic box, about the size of a small shoebox, buried under these rocks. Maybe someone buried a small pet out here. Onyx is like an early warning system. 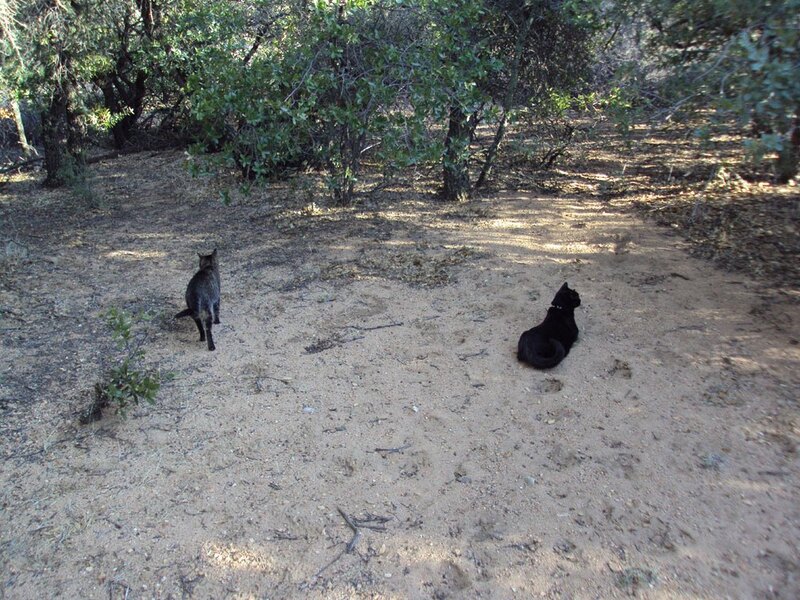 If he hears or sees someone coming near our camping spot, he’ll start to growl, even if they are over 100 yards away. It gives me a good heads-up whether we are inside or out. It’s pretty cool. Then, however, he runs and hides and leaves me to fend for myself. When you date and sign the notebook, please write something about the find, where you are from or headed, or whatever. When I find a cache with a friend, she starts looking through the items and I go for the notebook and see what people have written. Some entries are pretty interesting. Plan on it taking 2-3 hours for the out and back hike with about 40’ of climbing down the rocks to get to the cache. Be sure to wear hiking boots and consider taking a hiking staff. The ground is rough. What’s generally referred to as a ‘potato field’. 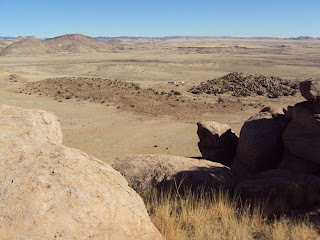 Sometimes when I hike up Table Mountain (why would someone name a mesa, Table Mountain? ), I pack a thermos of yerba mate and a paperback. When I get up there, I sit someplace for an hour or so and relax enjoying the solitude. One day I glanced up from reading, studied some rocks in front of me, and noticed something in a space between two rocks. 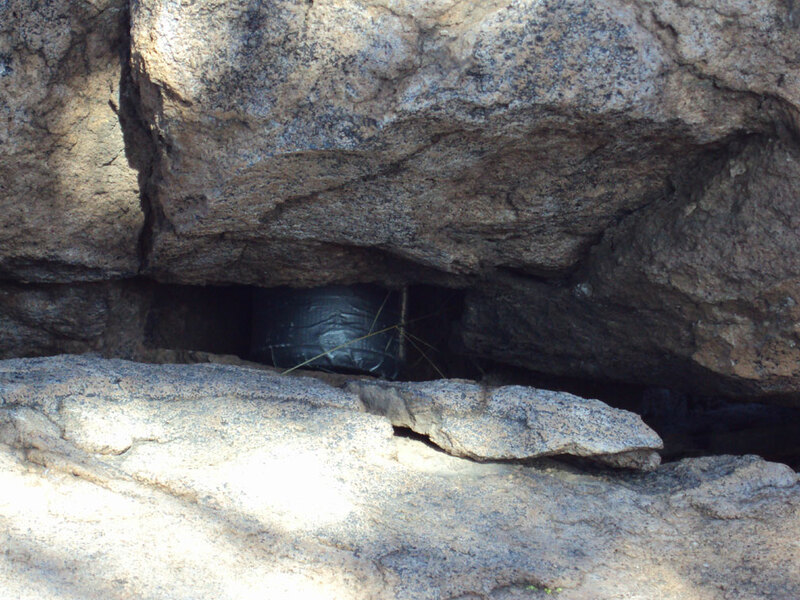 Yep, it was a geocache. The two posted caches up here are only accessible to those geocachers who have an upgraded membership so I cannot get the coordinates from the website. Well this time I pulled a ‘Lynn’. When I go after a cache with Lynn and we get close to the coordinates she just starts looking around for a likely hiding spot and generally nails it. One time she found a cache just by remembering the general area where it was hid in Bisbee. We didn’t even have a GPS with us. Unreal. One afternoon I placed a bunch of grapes and some loose ones out on the table prior to washing them. As I was putting the bag back in the fridge, I heard a grape hit the floor. Didn’t I level the rig? As I was getting a bowl down from an overhead cabinet, I heard another grape hit the floor. I look over and there’s Onyx. Leaning over from on top of the pantry bin gently pushing the loose grapes off the table. HEYyou gonna pick those up? 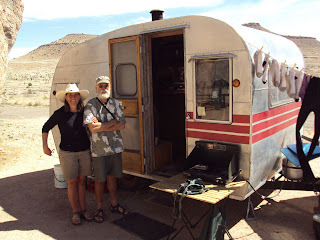 I met a neat couple from Salida, CO. Jack and Linda are artists and musicians. ACTIVE people who do a lot of river running back home. Here they were biking the trails and even went out for a ride under the full moon. I have GOT to try that. Jack and Linda have a gallery up in Salida (chivvisandlovell.com) which I will definitely have to check out when I get up that way. Sure wish I came across more people like them in my life as a vagabond. Salida sounds like a stellar town with all the music, art, river, and mountains. And it’s an active town with many people using their bicycles instead of their cars to get around. There are two natural food stores and the Arkansas River is right there for all kinds of water sports. The valley is surrounded by BLM public lands. Definitely worth a look-see at some point for a couple weeks. They have this ’54 ‘canned ham’ that they are restoring. It is way cool. They feel it was homemade possibly from a kit. I come across full-timers who say they have the wanderlust and have to keep on the move. 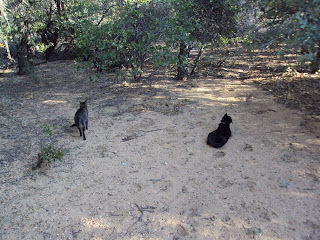 But when they get to somewhere new they don’t seem to do much, other than sit around all day, maybe drive around in the car, go shopping, and watch TV at night. It’s like they have not developed any interests, hobbies, sports, craft, art, music, whatever, in all their decades of existence. To me they sure don’t seem to have wanderlustthey seem to be bored, big time. I don’t know, maybe not having all that many years left has something to do with my striving to keep active. Maybe I just don’t need all that much to be entertained and I sure do get a lot of satisfaction from physical exercise and contact with the Outdoor. One would think that when people near retirement age, they would be pretty stoked about all the free time they will have to do what they want to do, when they want to do it. I have not met any but I’m sure there are a few who start on a program to slim down and tone up so they can be as active as they were years ago and thus get the most out of their last years. Definitely not the norm, however, never was, never will be. Seems such a waste. It’s like, as we get older, if something is hard, we don’t even try it. Neglecting the fact that it will get easier. I know for sure that life can improve as we move through our 50s and 60s. It took me quite a few years after my transplant to get back in some semblance of shape but life is SO much better than when I couldn’t even walk around the block. That was no type of life for me so I did all I could to help myself, just as thousands of others have done. For most though, they just continue on as is, huffing and puffing into their last yearsand then that’s itit’s all overthere ain’t no morethe fat lady has sung. Maybe that’s why I continue to work on my trail running. When I see the old guy in the black robe with that big hefty scythe comin’ my wayI’m gonna take off runnin’. I checked the Word document on my MacBook that has all my blog text. It’s nearly 130 pages. That’s without the images. Unreal. Never thought this blog would get to be so long. Might as well start a book. Most of us need variety and all of us need to keep growing. and allows us to most joyfully accomplish our purpose. Forget it. Go get a used 22’ Airstream with decent insulation and double-pane windows, hook up to 120V every night, and run ceramic heaters. I’m talkin’ cold here, not merely the 20’s and 30’sbut single digit and teen temps at night without electric hookups in small poorly insulated rigs. Most RVers just keep the furnace running and have a generator supplement one’s solar panels but the noise would drive me up the wall. It’s not why I go off to the Outdoors. 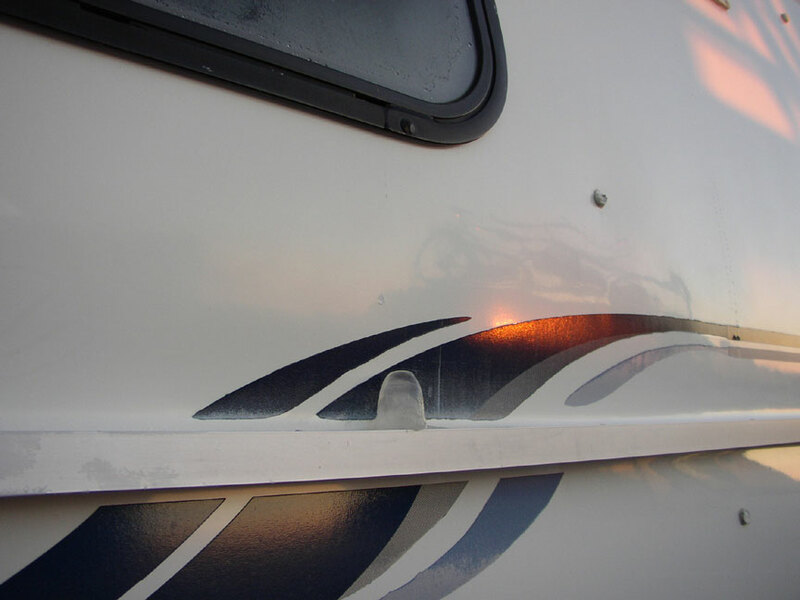 First off, small fiberglass trailers are not designed for these temps. Maybe the Oliver with its double shell construction and double pane windows would be okay. I don’t know anyone who dry-camps at these temps in one for extended periods. My casita is an absolutely stellar camper for three seasons. A part of each winter off the grid can be a tad nippy. This winter, since I left Moab in October, I had 72 days with 120V. 22 of them while at Lynn’s in Bisbee but that was mostly for my MacBook. The other winter days I was either dry camping or secluded camping off the grid. Last winter I had 89 electric hookup days with 15 of them in Bisbee. Really don’t need more than 60 days and might not even have that many next winter. Heading as far south as I do, I’ve found that I only really need electric hookups for November and December. Once the winter solstice passes, it generally doesn’t drop lower than the 20’s at night. Creampuff temps. And if for some reason I did not have access to 120V, with what I’ve learned the past few winters, I could get by but I’m not into roughing it at this point in my life. I sure get spoiled for two months with one of those little ceramic heaters. Condensation rather than cold is what bothers me at these temps with no electric heat. I can deal with the cold. The range vent and a window by my bed stays open a bit for ventilation all the time to help get the moisture out but it is nowhere near enough. If it feels like it will get down into the teens or lower at night, I’ll put pre-cut panels of Reflectix insulation over the windows. Really don’t know how much this helps. In the morning the inside of the windows will be covered in ice, not merely condensation, but ice. With all the moisture dripping out of the bottom of the window frames, you’ll get some nice little ice stalagmites forming on the belly band. Really could do without these. 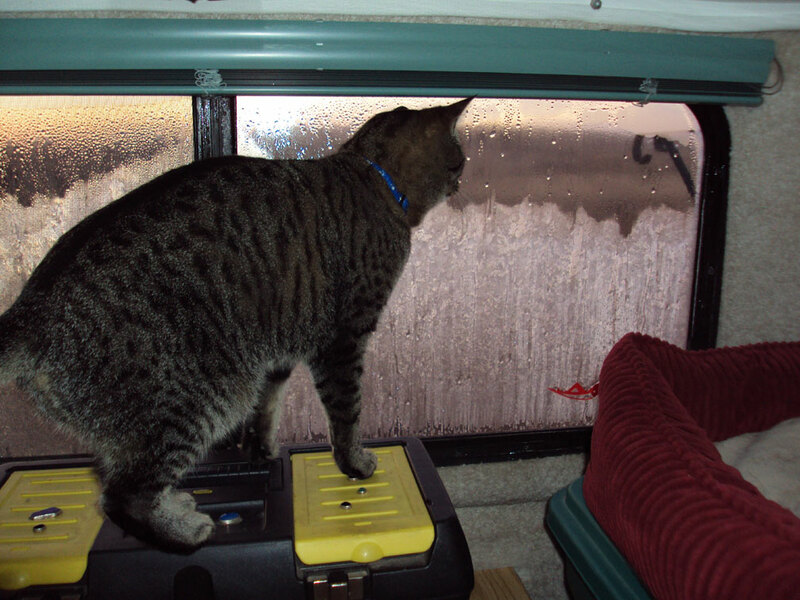 If you get 3 or 4 days of overcast skies and it’s too cold to have the door and some windows open for a while during the day, the rig is going to start smelling and feel dampnot a healthy situation. Luckily this has only happened to me 2 or 3 times in 4 winters. The windows just stay wet all day and night and water droplets form on the acorn pop-rivet caps along the ceiling. Whenever there is an opportunity, open the door and windows to exchange all the moisture ridden air. At least try opening the windows on the leeward side for a bit if possible. Then bundle up and go off hiking for a few hours to clear out your lungs. Each day as it’s getting dark, adjust the window openings to how you want them during the night because they will freeze in place and you will not be able to close or open them until the rig heats up in the morning. Be sure to not hang wet items in the rig to add to the moisture problem. If you must, put them in the bathroom and close the door. They won’t dry but at least they won’t be in a pile where mold will start to grow. Fit insulating foam in the roof vents and if your window frames are smooth, tape plastic film to the inside of some windows. Wedge a clothespin in the range vent so it always stays open. 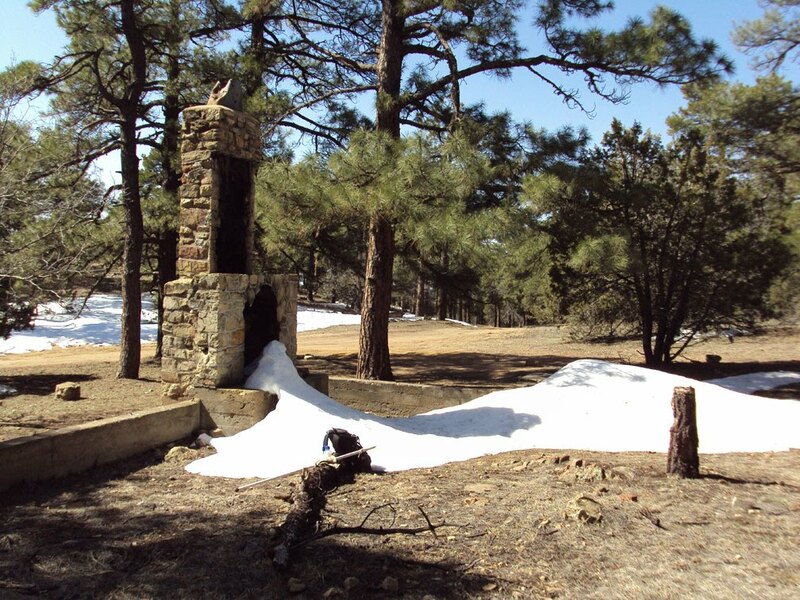 Try to spend winters in the southwest, at lower latitudes, and get down to 1,000’ elevation or lower. You’re shootin’ for dryness and sunshine. Angle the rig so the sun starts to shine in your largest windows as soon as it clears the horizon. Park out in the open so sun hits the rig all day. You will be getting some fierce winds down in the open desert but remember, the sun is your friend. Keep the overhead and lower locker doors cracked open for circulation or the moisture will rust any metal items stored there. Place cups of dehumidifying crystals in cabinets and closets to help alleviate moisture or else you WILL get mold forming in there. Wipe up the moisture from under the sofa cushions each morning. This is all SO much fun. I don’t use the water system. My fresh water tank is empty and the lines are blown out. I just use a 2-gal Reliance jug placed on the burner cover. If you use the tank and water pump, you need to get warm air down to all the lines so they don’t freeze. Remember you can always just run the furnace and generator all the time and not have any problems. Good grief. You will need quite a bit more than 6,000 BTU of catalytic heat for these temps. I use a 3,000 BTU Wave (the 6,000 would not fit in the trailer) and a 3,000 BTU Coleman catalytic heater. When it’s in the teens and windy, they are definitely not enough. I’ll turn on the furnace from time to time to get more heat in the rig. At these temps, I’ll generally be wearing a thin fleece jacket, scarf, and knit hat indoors. No big thing since the alternative is to leave the Outdoors and go to a campground with hookups. Drink plenty of hot fluids, even just water, and fill up on hot cereals and soups. Wearing socks to bed helps a whole lot if temps are in the teens. Do some squats to get the blood flowing first thing in the morning. Luckily there are very few nights of these temps this far south. I don’t know, I more or less take the cold in stride since I’ve done so much camping. Those with the RV mindset would have no part of this. And if you will only be doing it for a weekend or a few days, no problem, it’s like camping. There are ways to deal with the cold. It’s the condensation that’s my concern because of the health issue. Wintering in a small rig with access to 120V is no problem, something like living in a tiny studio apartment. If I were going to primarily stay in state parks and campgrounds, I’d get a 22’ Airstream. Why have a tiny 16’ or 17’ trailer if I wasn’t going to be pulling it down narrow forest and BLM ungraded roads? Kind of defeats the purpose of having such a rig. It’s also no real problem without 120V if temps will only be down in the 20’s and 30’s. Downright toasty. April Night SkyThe three stars in Orion’s belt always seemed to catch my eye whenever I went outside this past winter, more so than in past years. Don’t know why. Granted, it is pretty bright and distinct. 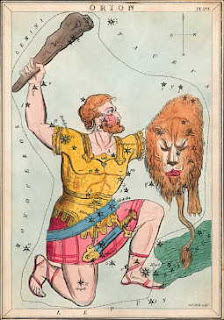 Orion refers to a hunter in Greek mythology. Orion looks very much like a person. First, you should spot Orion's Belt, which is made of three bright stars in a straight line. One of Orion's legs is represented by the bright star, Rigel, one of the brightest stars in the night sky. His two shoulders are made of the stars Bellatrix and Betelgeuse. You can see Betelgeuse's reddish color without a telescope. Other bright stars make up the two arms, one which holds a shield (sometimes depicted as a skin or lion’s head), and another that carries a club. Many different civilizations saw this constellation in the sky. The most famous stories come from Greek and Roman myths. Orion was a famed hunter, and in one story boasted that no creature could kill him. Hera then sent a scorpion to sting the hunter. Orion smashed the animal with his club, but not before he was poisoned. Both are now on opposite sides of the sky. They cannot be seen at the same time. A different story tells of the love between Orion and the goddess, Artemis. One day, Orion was swimming out in the sea. Apollo, who very much disliked the man, bet his sister that she couldn't hit the object in the sea with her bow. Artemis didn't realize it was her lover, and shot Orion with an arrow. 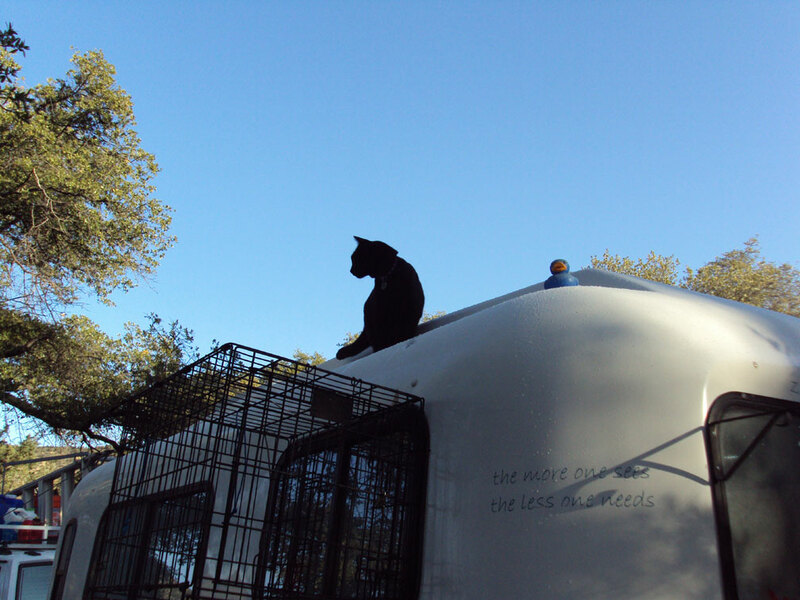 When she later found out what she had done, she honored the hunter by putting him in the sky. The Orion Nebula (M42) is located in Orion's sword, which hangs from the belt. This is a vertical line of what appears to the naked eye as three stars, but in fact when viewed with a pair of binoculars or a telescope you will see that they are all double. This area is one of the most visited by amateur astronomers. It’s an emission nebula where new stars are born. It can be seen with the naked eye under a dark sky, and it can be seen well with binoculars, and details from within it can be seen at low powers with a telescope. might not be the best way to go. be out of step with something higher.